Print speed may vary depending on the type of output. Continuous output speed is based on RPCS driver (high speed mode). ISO speed is based on RPCS driver (reference data). Wireless LAN (IEEE 802.11 b/g/n) is available for SG 3110DNw. Yield measuring method: ISO/IEC 24711. 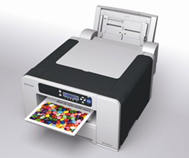 Low yield print cartridges are also available (600 sheets). High yield only available for SG 3110DN/SG 3110DNw. Printer language PCL5c + PCL6 only available for SG 3110DN/SG 3110DNw. Duplex only available for SG 3110DN/SG 3110DNw. Options only available for SG 3110DN /SG 3110DNw.